The Novice by Taran Matharu is a high fantasy novel set in a world in the midst of the industrial revolution and locked in an inter-species war. I found it a to be a refreshing read that manages to have an interesting plot while avoiding most cliches and reliance on romance. Fletcher, an orphan living in a small village in the mountains, discovers he has the ability to summon demons. This talent is in high demand in his country and he finds himself at a military academy where he will be trained with other young summoners. Fletcher learns much about his new powers and makes new friends in the academy, which is lucky considering the children of powerful nobles are training alongside him and they don’t like his talent. As different powers align and plots are uncovered Fletcher and his friends have to decide what side they want to be on, and how far they will go to keep the peace. I really liked reading The Novice. It had a very different feel to a lot of the things I had been reading, especially considering the quality of books I had recently been reading. There have been a lot of sub-par sequels recently. There was no romance in the book, and the style of writing is something that I aspire to. It kept me engaged from beginning to end and the plot never had dull moments where it felt like nothing was happening. Despite taking place over a year this book was very good at only showing the important parts. The world is well thought out and the history is provided in a way that is interesting. Enough information as given in the lessons for me to understand the magic system but not so much that it got boring. There were no info dumps and the world building took place in a way that was nicely spaced through the story and helped to build character although it was slightly predictable. I did enjoy the idea of having an industrial revolution type setting in a fantasy world, although having the orcs as a purely brutish race made them too much of a ‘clear evil’. The elves and dwarfs did receive a good selection of characters with varying moral reliability which was good to see. There was a wide range of characters, all of which had complex issues of their own. I felt like there could have been a bit more character development but I can hope for that in the sequel. Fletcher had a nice selection of skill-sets and weaknesses, and he was in no way a ‘special snowflake’. He didn’t seem especially powerful, he was just roughly in the middle. His powerful demon was countered by his lack of talent at harnessing his magic and this was nice to see. There were times when I doubted his success. The plot unfolded in a natural way that flowed really well. Every scene had a purpose if not more than one, and the were many situations where things went wrong. There could have probably been a few more things go wrong along the way, or just the lows be more extreme and have more effect, but I did enjoy the plot. There was a stage right near the end where I thought everything was going to go well but then something happened that I wasn’t expecting although looking back on it, I probably should have seen it coming. It will be interesting to see how this story progresses, and I am hooked by the cliff hanger at the end. 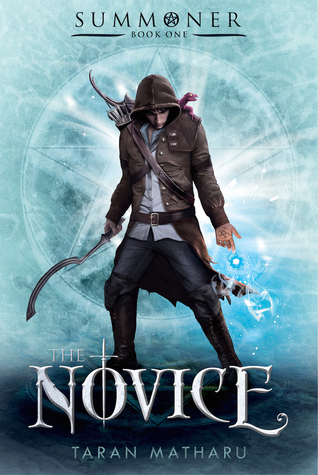 The Novice was a good read and a breath of fresh air in a world of YA books that revolve around romance with fantasy worlds that are too magical. The world in The Novice was believable in a way that is hard to explain, and the plot was simple and easy to follow but I could see ways for the world to expand. I rate The Novice 4 out of 5 and I will be reading the sequel.